Narrative: what’s the story, what we are learning, what we can do and why. Multi-level analysis provides context for every node, aggregations at every level, and comparisons of orgs, groups, and positions internally and externally. 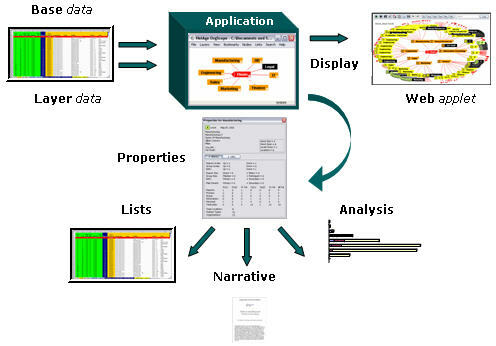 Data from the existing systems (e.g., HR or LDAP) feeds a dynamic display of all positions (or other node types) in the formal organization (or other trees of data). Additional layers of data fill out the network for visualization. For built-in analysis, OrgScope generates key measures for each network node, whether person, position, or information object. The map is dynamic and alive with URLs, making it possible to navigate complex organizations of people and information. Base data is generated from a db of node records with a set of parent links connected to a root position. Additional nodes and links are added as layers, the total of which is calculated as a whole and displayed. Lists with metrics puts faces on every number, positional metrics that can be used to sort and order lists according to any chosen measure, or combination of measures.